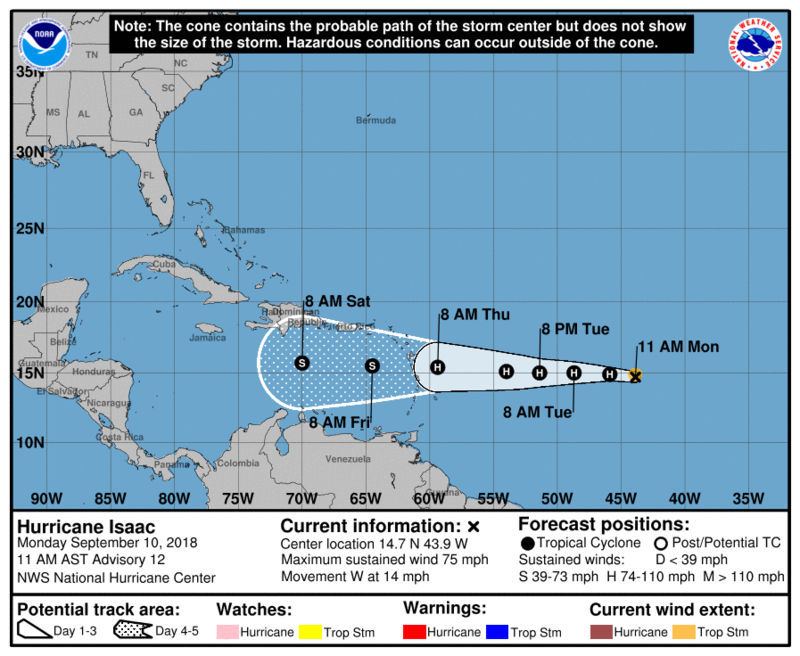 The Disaster Management Coordination Agency (DMCA) is urging residents and visitors to review their hurricane plans, continue with their hurricane preparations and remain vigilant as Hurricane Issac approaches the Lesser Islands this week. The DMCA says at this moment, they are not expecting that Montserrat would be affected by any hurricane force winds, but, tropical storm winds. However, as the storm progresses, things can change at a moment’s notice. Therefore, residents and visitors are asked to monitor the progress of Hurricane Issac and not be complacent with their hurricane preparations at this time. At 1100 AM AST (1500 UTC), the center of Hurricane Isaac was located near latitude 14.7 North, longitude 43.9 West. Isaac is moving toward the west near 14 mph (22 km/h). A westward motion with a slight increase in forward speed is expected through the end of the week. On the forecast track, Isaac should move across the Lesser Antilles and into the eastern Caribbean Sea on Thursday. Maximum sustained winds are near 75 mph (120 km/h) with higher gusts. Additional strengthening is expected over the next day or two. Weakening is forecast to begin by the middle of the week as Isaac approaches the Lesser Antilles.